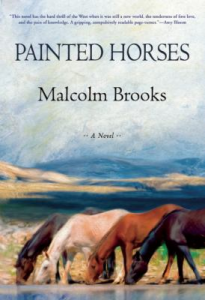 Malcolm Brooks’ new novel Painted Horses takes place in post-WWII America. Catherine Lemay eschews convention, choosing archaeology over marriage to a Manhattan banker. She goes to work for the River Basin Survey near the Montana-Wyoming border to identify any significant archeological sites before the Harris Power and Light dams the river and floods the canyon. The building of this dam is whipping up bad blood on all sides. Even the Crow can’t agree—some are willing to sacrifice their sacred canyon for jobs. Jack Allen, a despicable mustang wrangler who guides Catherine on her daily trips into the canyon, is actually paid by Dub Harris to lead her astray. Undaunted, she enlists the help of Miriam, a young Crow girl with her own modern ideas, to find the ancient cave paintings rumored to be in the canyon. During these excursions, Catherine encounters a mysterious cowboy named John H, a loner with a penchant for leaving behind painted hand prints. His unpleasant connection to Jack Allen prompts him to become Catherine’s ally in her search for the precious rock art and to stop the dam construction, but neither anticipates Harris’ dirty tricks. Malcolm Brooks delivers an authentic story, examining in gripping, page-turning prose what it means to live in the West, where, as Catherine tells Miriam, “the best way to understand the present and to take some control over the future is to know what happened in the past.” An outstanding debut novel that will linger in the reader’s mind.